I guess I should credit Trina and the cake she made here, for the inspiration for my inspiration. My Mom made Kira a beautiful white eyelet dress for after her baptism, so eyelet became part of the theme, too. I sent out the photo at the top of this post as part of the invitation. I took the photo of her in the eyelet dress and then added lots of textures, and a rainbow, and the text of the rainbow song (which is really called, “When I am Baptized”). 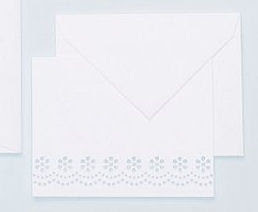 For the actual information, I bought these eyelet cards from the Martha Stewart weddings section at Walmart, and printed them on my computer. I didn’t get the whole wedding kit, but just the box with this size of card and some of the pretty eyelet seals for the envelopes. There were enough of these cards for her to use them as thank you notes, and for me to use them in the treasure hunt. We had a lot of family here for the baptism and invited a couple of her close friends and their families, too, so we had to plan for a pretty large group. My mom was in town, and one of her famous birthday dishes for us growing up was a salad bar. But it was better than restaurant salad bar because of her homemade croutons and homemade blue cheese dressing. So good! Kira decided she wanted a salad bar and I decided I would make it fit in with the theme. I added one or two food elements that didn’t normally make it into Mom’s salad bar, like blueberries, and purple cabbage and onions, to ensure that every color of the rainbow was represented in the salad. They did look beautiful and went over well. Kids were pretty excited about eating salad. I think it helps when they get to pick what they put on it. Of course, these jello cups were a BIG hit! They take a bit of time but are easy to do if you are patient and have a little fridge space. We just layered each color of jello in the cups one at a time, making sure the previous layer had hardened in the fridge first. 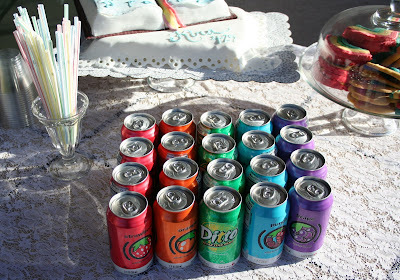 I had to buy rainbow soda (there is yellow on the side of the lemon-lime, so the basic colors were all represented). I was excited by the simple graphic design of these Safeway brand sodas. Here is the birthday girl enjoying her birthday meal. What you see on her forehead was another big hit, that was really easy to do. We just bought some store-brand (Fry’s, I think) garlic herb breadsticks (you know the kind that come as dough in the tube), and instead of baking them as sticks, bent them into rainbow shapes before baking. They were yummy, and fun, and thematic. These cookies would have been really good, if I had taken the time to find the right recipe first. Still, you might want to experiment with the concept. I think we made some like this years ago. You make a fairly stiff sugar (butter) cookie recipe and divide the dough into three or four sections. Add food coloring to each section until the dough is clearly red, yellow, blue (or what ever other color you are going for. Roll each layer out fairly thin (1/4 inch or so) and then stack them on top of each other. Then slice a thin cross-section of the dough and bend the sides of the rectangle down to make a rainbow shape. (Does that make sense?) Then bake. We made some flower cookies with the extra dough. I have a love/hate relationship with this cake. There are parts of it I love and parts of it I hate. But I am sharing it with you anyway, so you can take the good ideas and improve upon its’ shortcomings. Love: The eyelet scalloped, fondant “tablecloth” I put over the bottom layer of cake. My sister Trina, makes working with fondant look oh-so-simple. I wish she had been there to help me with the rest of the cake, but I asked her for directions for this part. She suggested I make a pattern out of fabric, first. I used a small flower cookie cutter to trace the scallops on to a thin piece of light-weight scrap fabric, then cut out the pattern and laid it on the rolled out fondant. I used a paring knife to cut around the edge. Then to make the holes, I just used a big and little string tip. The holes punched out easily. I loosely draped the fondant over the top of my sheet cake which was already frosted with buttercreamfrosting. Love: The Starburst rainbow bookmark. It just would have been better if I could have found a blue or green Starburst. I took the Starbursts and melted them in the microwave for just a few seconds. Then I rolled them into long, skinny snake shapes, put all of the colors together, and rolled them out to make a flat ribbon. I used a knife to cut a finished edge. 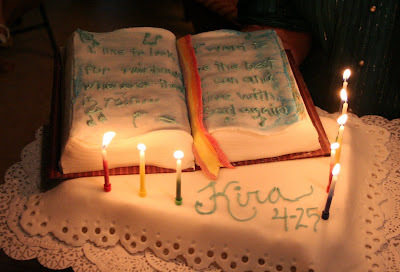 HATE: The writing on the cake and the messy fondant edges on the book part. I had a book cake pan and thought this would be a good time to use it, so I could include the words of the song on the cake. I had initially though I would stamp the lyrics using rubber stamps and food coloring, like I did here, but for some reason, it wasn’t working this time. The food coloring was going everywhere and I couldn’t make the letters legible. At this point I was running out of time, so I decided to go to plan B (or C) and pipe the letters on. This might have been OK, except I made my frosting extra stiff and piping was a nightmare. I painted some food coloring around the edges to disguise some of my failed stamping attempts. If only I had had all day and more fondant, I’m sure I could have made a masterpiece. *sigh* That is the danger of party planning. I always have at least a couple of unfulfilled visions when the party starts. Something always has to give. What I should have done was called my friend, Trish, who lives on the other side of the valley. She is a brilliant baker and blogger, and made this amazing rainbow cake for one of her friend’s baptism party with a similar theme. I wonder how that would have looked covered with my eyelet fondant tablecloth. My family has a long-standing tradition of making the birthday boy or girl work for their presents in the form of a treasure hunt. We’ve done them every imaginable way and they are usually more fun than opening the presents. In keeping with our theme, and the focus on spiritual things, she had a Scripture Treasure hunt this year. We gave her her first present which was her own set of scriptures, and inside the front cover was a card with a couple of scriptures to read. I don’t have all of the clues in front of me to tell you what scriptures I used where, but each card would give her a scripture reference and when she looked up the reference she would have to figure out a key word that would lead her to where her next clue was hiding. For example, the scripture about faith being like a seed, led to a clue hidden in the garden. One about Noah’s ark, took her to our “sand boat” in the backyard. I even hid one in my husband’s pocket and had her look up the commandment about honoring thy father and thy mother. It was amazing that the girls were just as excited about this as they had been about Nancy Drew or Kim Possible! 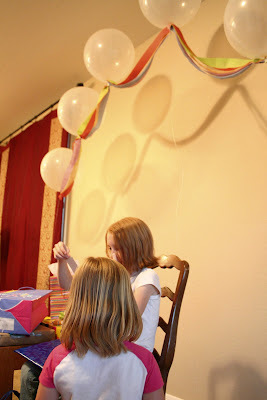 I wanted to use helium balloons to hold up a giant crepe paper rainbow outside. I found some clear 17″ round balloons at a local party store. Initially, I bought 8 because she was turning 8, but one popped during inflation, and it really worked best to just use 6 after all. The day of the party turned out to be incredibly windy. I took a helium-filled balloon outside to see what would happen, and instead of floating up, it went completely sideways. So we set up the rainbow on a smaller scale in my mostly unfurnished living room. I am including this very blurry picture (sorry), because it is the only one that shows the whole set- up. The balloons are tied on with fishing line to jars of candy in rainbow colors (red: red hots, orange: orange slices, yellow: lemon heads, green: green m&ms, blue: strange mint Mike and Ikes(?) I found at the dollar store, purple: grape Mike and Ikes.) The crepe paper is taped to the base of each balloon, and all of the rainbow colors are represented (though a bit pastel) in the crepe paper. I had some little boxes with handles (a little too cheap from the dollar store–they kept falling apart) for guests to scoop their favorite candies into to take home as their favor before they left. And the birthday girl felt very special sitting under the rainbow to open her presents. I almost scrapped the rainbow entirely, but she knew I was planning it, and kept asking where it was. She and her friends loved it and identified what it was immediately. So maybe I shouldn’t call them unfulfilled visions…just adapted visions. For more about LDS baptisms and why 8 is such a special age go here. I love the rainbow salad bar! Everything looks wonderful! Everything looks great… hmmm, I might just use that theme for my daughter’s 2nd birthday. Awesome job! Wow. I had no idea baptisms were celebrated like that. wow. I love your colorful party idea! Kudos on the rainbow salad bar =D! You never disappoint me! What a fun Idea. This is one amazing party!! Love it! All the details are fabulous and I just love how the food goes right along with the theme. The balloon rainbow decor is beautiful. Kendra, this is so cute!! Love all the rainbow elements. I love how your book cake turned out! I think you did an aawesome job! If you ever need to put lettering on one of your cakes like this one,and don't want to pipe it on, Wilton makes food coloring pens called food writers. I don't know if you have already heard of them, but I have used them to write on fondant, cookies, etc. I always have them handy for things like this. My daughter loves to decorate with them! Ah, you are so sweet to mention me and my rainbow cake! Just love you! What a wonderful day filled with fabulous ideas. You are THE idea lady!!! I'm so glad that Kira had her DREAM birthday! Wonderful. Simply, wonderful. Those are amazing invitation for the Baptism! wow. impressive!!! love your blog. Great party 🙂 Love how you incorporated so many rainbows! What a beautiful party for such a special event in Kira's life. Your details are what makes it! Her picture and invitation are beautiful. I can't believe that cake–a true labor of love!